Playtime is essential to the healthy physical, social and emotional development of children. With families’ busy schedules and the increased use of technology as a form of entertainment, children are playing outside less and less. Playtime, both inside and outside, allows a child to use their imagination, which is extremely important for cognitive development. Being outside allows your child to be much more active in their play and is a change of scenery for them as well, providing their senses with different smells, sounds, sights, etc than they are exposed to inside. Here are some outdoor activities that your children will thank you for! If your children are not already familiar with the classic games of hide-and-seek or tag, teach them. These games are classics because all children love them, the rules are simple, and they can be played by children of all ages. They require no tools and can be played just about anywhere. These are a great way to ensure your child gets the physical activity s/he needs. Raking is a task that needs to be completed each fall so why not have some fun with it/ Your children can play outside while you rake or they can even help by helping you bag the leaves. This is a great way to spend quality time together while also completing a chore off your to-do list. 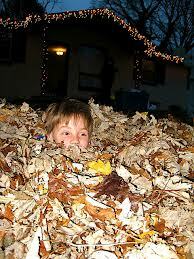 To make this task even more fun, pile the leaves up as high as you can and allow your children to jump in the pile. Children love this! Leave the very first pile of leaves for them to jump into. This provides them with extra time to play in them while you rake the rest. The leaves are easy to gather again when they are done playing in them. As an added bonus, playing in the leaves also provides for some great photo opportunities. Another great way to get something off your to do list while having fun with your children. A great way to cool off as well. Children have to eat so why not move the meal outside? You can set them up on a picnic table, if you have one, or on a blanket. Let’s face it, sometimes it is nice to not have to clean up all the crumbs from the floor too. Share a little with the animals. Such a simple idea but one children love. Spread a blanket on the grass and sit or lay down with your child and read, read, and read. Take your children on a walk or simply explore your own backyard but let them explore. Let them look at flowers, the leaves on the trees, under rocks, in puddles. It is amazing what they will discover and you may just learn a little something yourself! Hook up some music outside and let them dance, dance, dance! As a variation you can play outdoor freeze dance. Water balloon fights are not something a child gets to do everyday and they are a great way to cool off. Of course, they can get out of hand without rules such as no throwing at peoples’ heads, so make sure your children know your rules ahead of time. Water balloon fights also require some preparation and clean up but they are worth it. Have the children involved in the clean up of the broken balloons. You can make it yet another game by seeing who can collect the most broken balloon pieces. Or you can assign a different color balloon to each child and have them collect only the pieces of balloon in their assigned color. Kites are relatively inexpensive and you can even make your own at home (click here) or search the internet on your own for other step-by-step instructions. Children love to run around “free” and feel the grass beneath their feet. It is not something we do often enough. I do not mean play on a construction site as we all know this is dangerous. What I mean is to walk or drive to a construction site and watch from a safe distance. This is an especially great activity for children who love building things and/or love trucks and machines. Whether it be a flower garden or a vegetable garden, most children love to dig in the dirt. Gardens are very educational and beautiful to look at or tasty to eat. Children love being able to pick food from their own garden and eat it for supper that night! Thanks to sidewalk chalk and paint, children who love to draw can now use the biggest canvas they have ever seen – your driveway! These drawing substances wash off in the rain so no need to worry about any of your childrens’ creations becoming permanent fixtures. Don’t be shy! Get in on the fun with your children! Decorate the driveway as you see fit! My daughters and I have decorated the driveway for Easter, Christmas, Halloween, birthdays and many other special occasions. They also loved practising printing their names and other simple words. Winter can make it much less tempting to get outside and have some fun. Adults typically cannot wait for the white stuff to go away but children love the snow. Shovelling the driveway cannot be avoided, so why not get them outside helping you? Children love to be helpful. If you have one of the scoop shovels you can always take breaks and offer your children a ride in the bucket of the shovel. My daughters love that! My daughters are happy with snow piled up to make walls, no roof. We made snow seats for them to sit on and just left an opening for a “door”. What child does not like to build a snowman? My daughters actually own a “Snowman Kit” which was purchased for them as a gift. It comes with two pieces of coal for eyes, a plastic carrot for a nose, a black felt hat, and 3 large, black buttons. We use them everytime we build a snowman and as long as we pick up the pieces before the snowman melts or shortly thereafter, before the pieces become frozen in the snow, we always find the pieces no problem. We have had it for years and still have all of the pieces. You can hide items you already own or have purchased or you can simply have your children hunt for items you know will be easily found outside such as a rock, a leaf, a stick, etc. You can make the hunt more challenging by adding items that could very likely be found outside but are not laying around just anywhere, such as a tennis ball or a piece of ribbon, etc. Check out the official geocaching website for more information on this very entertaining outdoor activity. It is basically a treasure hunt where you use GPS coordinates to find “caches” hidden by fellow geocachers. There are currently 1, 236, 409 active geocaches around the world.